Three of my sisters have birthdays this month and next. Three in a row is a lot of female gift giving, but it's my favorite kind of gift giving because women are so much easier than dudes to buy/ make gifts for. We all love getting pretty accessories and can never have too much jewelry, bags, scarves, etc. This ombre dyed scarf makes a great gift and is a an easy way to get started in the art of tie-dying. I made one for each sister and figured that, while I was at it, I deserved a cute gift as well. This project doesn't require much knowledge about tie-dying and it is fairly easy to construct. Follow my simple tutorial below to make one for yourself or to give as a gift. 1. Cut the fabric into 1 1/2 or 2 yard lengths and any width you desire. Twist the fabric and tie the string to one end. 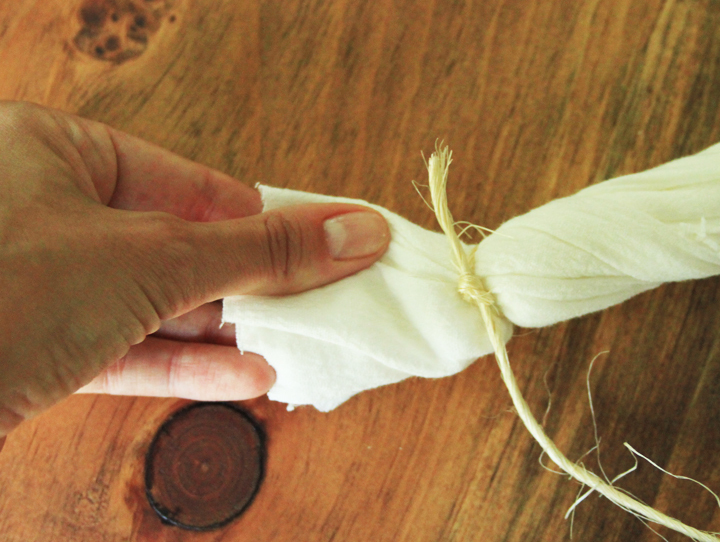 Wrap the string around the twisted fabric in the opposite direction of the fabric twist so it doesn't come undone. When you have reached the other end, tie a knot. 2. Submerge the scarves in hot water. The hot water will open up the fibers of the cloth to allow the dye in. Gently squeeze the excess water out each scarf and set aside. 3. Fill a small cup or jar with about a cup of hot water. Put a heaping tablespoon of Procion dye into the water and stir until the dye is dissolved. I used a heaping tablespoon of blue and a teaspoon of red to make my dark purple dye. You can purchase Procion dye here. 4. Fill a bucket with about a gallon of hot water. Sprinkle approximately two tablespoons of salt into the water. Then sprinkle a heaping tablespoon of soda ash fixer into the water. Soda ash fixer reacts with the dye and fibers and makes the dye adhere to the fibers more permanently. You can purchase soda ash fixer here. 5. Now dump the dye into the water and stir until the salt, soda ash and dye are thoroughly diluted- about 1-2 minutes. Place the ends of each scarf into the dye and pin the middle of the scarf to the bucket. Leave to soak for at least one hour and up to 6 hours. As the fabric soaks, the dye will move up the cloth creating an ombre effect. 6. Rinse the scarves in hot water. The water will remove the excess dye and the hot water will allow the dye to penetrate fabric further. Repeat the process with a different color in the middle of the scarf. Wash the scarves in a washing machine set to cold water and then dry them. 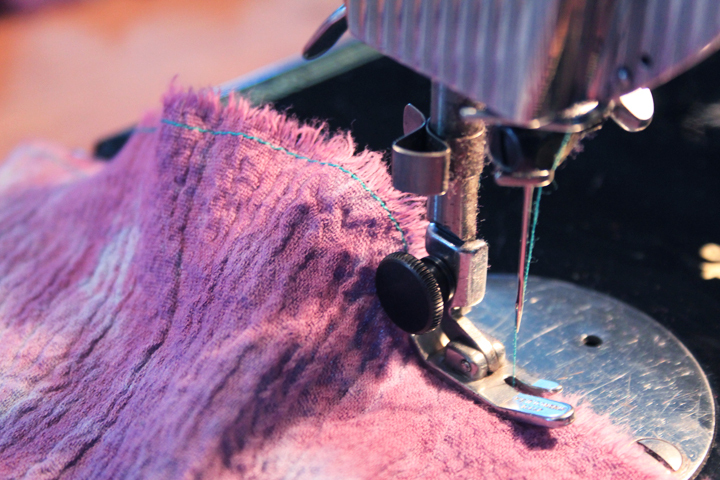 Sew the edges of the scarves to prevent them from fraying.